Once again, we extend to you our most sincere thanks for your generosity toward our work and the village Alaskans whom we serve. You are our strength. Together, we beam inspiration, education, information and companionship into the most far-flung and isolated places in North America. Thank you! 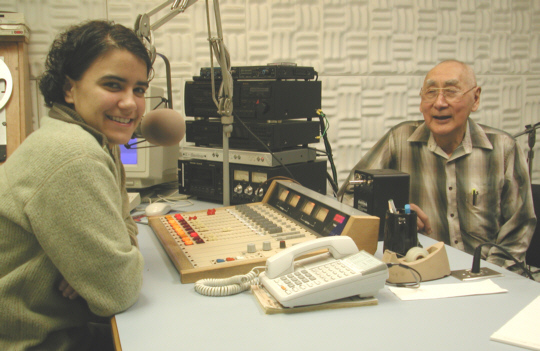 (Left) KNOM volunteer Julia Arrotti chats with Inupiat (in-OO-pee-at) elder Dan Karmun in KNOM studio C.
Dan was born in the village of Deering, 120 miles northeast of Nome, in 1926. Highly respected in the region, he’s a retired seal hunter, reindeer herder and airline station manager. Dan has appeared over KNOM many times throughout the years. Like KNOM'ers Tom Busch and Ric Schmidt, he has been president of Nome Rotary Club. Recovering nicely from a brain aneurysm last summer, he remains active in senior issues statewide. BEAR-LY: February 5th, as he does every morning, engineer Les Brown drove to the remote KNOM transmitter site, walking the final 400 feet through deep snow in the morning darkness. He was unaware that someone in a nearby cabin had spotted a polar bear prowling the area overnight. We are thankful that Les’ transmitter check was uneventful. Since then, he’s been performing his daily routine in late morning, when the sun’s up. to your will. God bless you! INSPIRATIONAL SPOT: There is always enough evidence for those willing to believe; there is never enough evidence for those who refuse to believe. A few weeks ago, fellow volunteer Tim Bodony and I had the opportunity to visit the village of White Mountain. 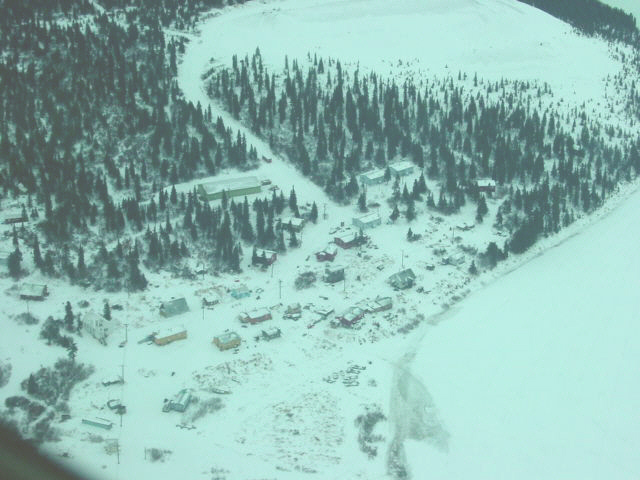 (At left, you can see a portion of the village from the air with the frozen Fish River at the lower right). It’s one of the smaller villages in our region with just slightly over 200 inhabitants, almost all of them Inupiat (in-OO-pee-at) Eskimo. It always amazes me that there are entire functioning communities here in remote Alaska that contain fewer people than were in my high school graduating class back in Indiana. Tim and I traveled to White Mountain via bush plane. These flights are always something of an adventure, but wow, the final turn to land on the air strip was an absolute mid-air U-turn with the plane almost completely sideways. After we landed, Tim and I were offered a ride into the village by the Bering Air agent, who drove a snowmobile with a sled towed behind it. Tim shared the snowmobile, but I really lucked out and got to stand on the sled’s runners as we drove in. The purpose of our trip was primarily to witness a historic healing. White Mountain was going to dance. You see, when early Christian missionaries arrived in Western Alaska, certain denominations took an aggressive stance against Eskimo dancing. They declared it sinful and banned the practice, and did so in such a vigorous manner that in some villages the dancing died entirely. Explaining to someone who has never been here what losing the Native music can mean to a person and a people is very difficult. I guess one way is to try and imagine: what if someone took all of your records, all your CD’s, and shut down all of your favorite radio stations? What if someone came into your church and took the instruments and forbade you to sing the songs you worship with? What if you were no longer allowed to sing, or even hear the national anthem? What if, on top of that, these people replaced everything you used to listen to and sing, with songs in a completely foreign tongue played on instruments you had never heard. INSPIRATIONAL SPOT: Prayer is a way of life which allows you to find a stillness in the world where you’re open to God’s promises and where you find hope. In prayer, you encounter God in the midst of the turmoil, distress and joy, and in the loneliness of your own heart. top Imagine a whole generation of children raised without your lullabies and the songs you grew up with. All they know is this strange new music. How would your life change? It’s hard to say, because, after all, how could that ever happen? Well, here it did happen. And the damage is only beginning to be understood, and hopefully, reversed. As the Eskimo culture suffered, so has its people, and their villages have since been ravaged by the social ills of alcoholism, poverty, and domestic and sexual abuse. Much of this has been attributed to the loss of their culture, and in many ways their community. I’ve only been a volunteer here for a year and a half, but it didn’t take me a month to realize that living in communion with your neighbors is deeply essential to survival in a place as barren and frigid as this one. White Mountain had not danced in seventy years. Many elders in the village could remember having seen it, but had never been taught. 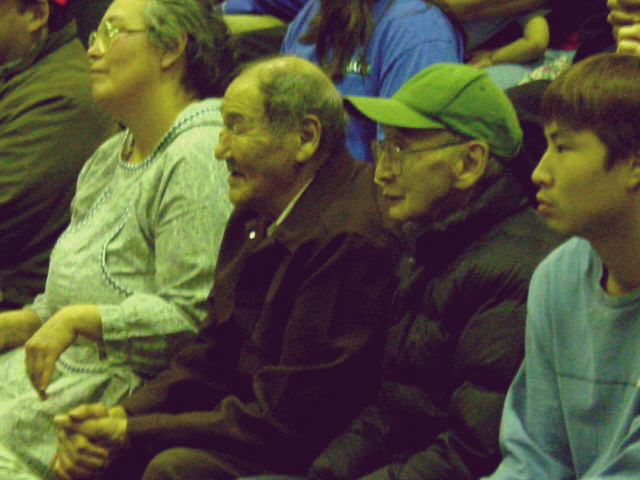 Della came to White Mountain for two weeks and instructed the community in not just drumming, dancing, and singing, but also showed them how to prepare a walrus stomach and stretch it over a drum frame to make a proper Eskimo drum. She prepared them not just for one performance, but helped them create a foundation that would allow dancing to continue and grow in White Mountain’s own, new tradition. So, on behalf of KNOM, Tim and I had the opportunity to watch and record the very first White Mountain performance of Eskimo music and dancing in the new century, in this new world. It seems strange to speak and think in terms as large and full of import about an event that occurred in a small gymnasium in a small village at the edge of the earth. But having sat there and witnessed it, having heard their voices and watched the faces of children and parents and grandparents, I began to understand a little better the idea that every hair on our heads is counted, that no fallen sparrow goes unnoticed, and that we are never alone. INSPIRATIONAL SPOT: What should not be heard by little ears should not be expressed by a big mouth. top Meet KNOM program director Ric Schmidt (left). Ric served as KNOM volunteer in 1984-85, and left to become founding general manager of Portland, OR Catholic radio station KBVM-FM. In 1995, he returned to KNOM as program director, supervising all of the station’s programming, except for news. Ric’s wife Lynette is inspiration director for KNOM. 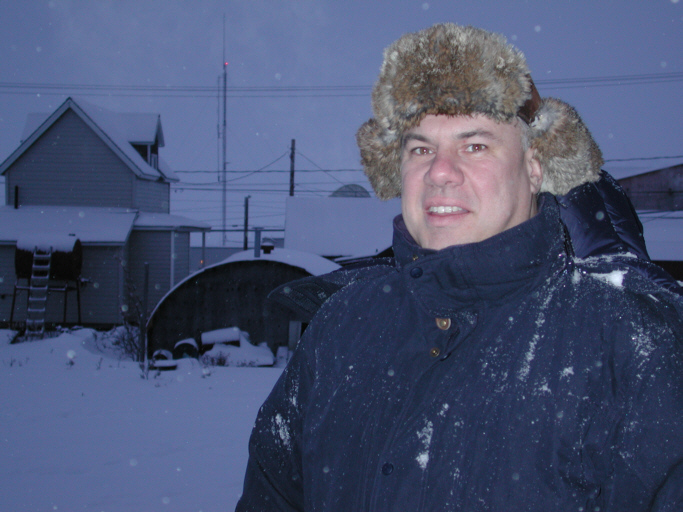 Recently, Ric and three of their six children appeared in the Nome production of “Our Town.” He is secretary/treasurer for the Alaska Broadcasters Association and current president of Nome Rotary Club. These days, Ric’s spare time is spent mostly playing with the kids. We thank Our Lord for his generous service. In this photo, taken at about 10:30 AM February 7th, you can see that, with spring just a few months away, light is beginning to return to the Nome morning. THIRTY YEARS AGO: In February 1972, snow reached above some second-story Nome rooftops. In some parts of town, cars drove through “canyons” of snow....To improve village reception of KNOM, the station offered kits containing wire and insulators and instructions on how to build receiving antennas. IN HIGH PLACES: Throughout Nome, you’ll hear KNOM playing from the ceiling speakers in the largest stores, from radios in many others, and on the telephone “hold” button for many businesses. Where else can you say that of a Catholic radio station? Thank you once more for your faithful financial help and your prayers in support of the oldest Catholic radio station in the United States. We are deeply grateful. Usually, the months of February and March bring heavy snows and high winds. Whatever the weather, we remember you in our own daily prayers. May God bless you greatly for your support for our work.